Officials say Virginia Railway Express and Amtrak will operate normal schedules while investigators determine what had caused a freight train to derail near Washington, D.C.
Officials from both rail services tell news outlets they will operate regularly Monday following the CSX train derailment Saturday morning in Alexandria. No injuries were reported, and the train was carrying cardboard, trash and scrap steel. National Transportation Safety Board Chairman Robert Sumwalt says indications are the train was traveling 30 mph. The speed limit is 50 mph. The train came off the tracks as it approached a bridge. Crew members told investigators they felt an unusual, "soft or spongy condition'' to the tracks moments before the derailment. 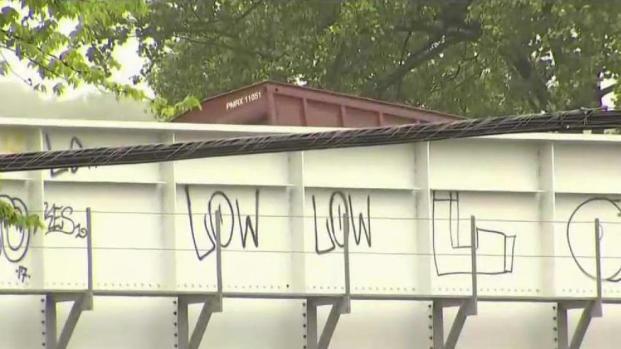 Fire officials say 30 freight-train cars have derailed in northern Virginia due to an apparent partial collapse of a railway bridge. News4's Derrick Ward reports. The 167-car train was bound for Rocky Mount, North Carolina from Cumberland, Maryland.